...from dirt and stains with our floor cleaning services. Our process allows us to remove tough stains like gum, grease, ink, urine, and blood. Before we get started, we move the furniture and pre-treat the floor with synthetic detergents to lift dirt from the carpet fibers. We also put tabs on your wooden furniture legs to keep the wood from absorbing the moisture and getting stain or wood dye on the carpet. 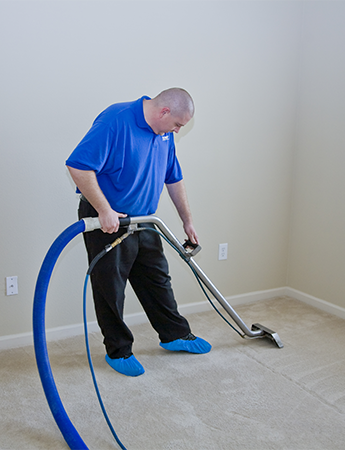 Next, our experts steam clean the carpet to get the dirt out of your carpet and into our truck's waste tank. Avoid squishy, wet floors, we dry and groom your carpet with the fragrance of your choice.